We plan to build 20 Megawatts worth of electrical infrastructure that powers HMC's fleet when in port by 100% green energy. 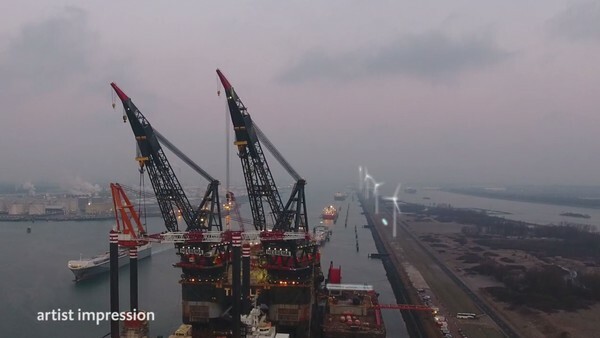 It is envisioned all vessels from HMC - the Sleipnir, Thialf and Aegir - can be fully electrically operated in the future. At the time of writing, the feasibility study is being evaluated. In order to realize this project, a Memorandum of Understanding has been signed on the 7th of July 2018 with Heerema, Eneco and the Port of Rotterdam. We believe that together, by freely and openly sharing information, we create a sustainable and economically feasible business case that is a win-win situation for everyone involved. Each partner in the consortium has knowledge and abilities to strengthen the case. We have divided the partners into maritime and public partners, facilitators and service providers.